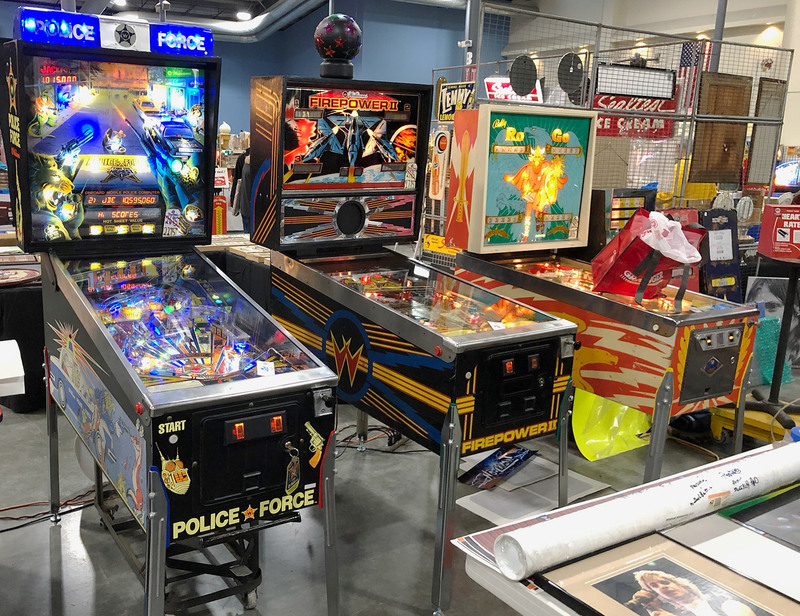 The Chicagoland Show is in its 39th year of operation and claims to be the largest and longest-running coin-op and collector show in North America. 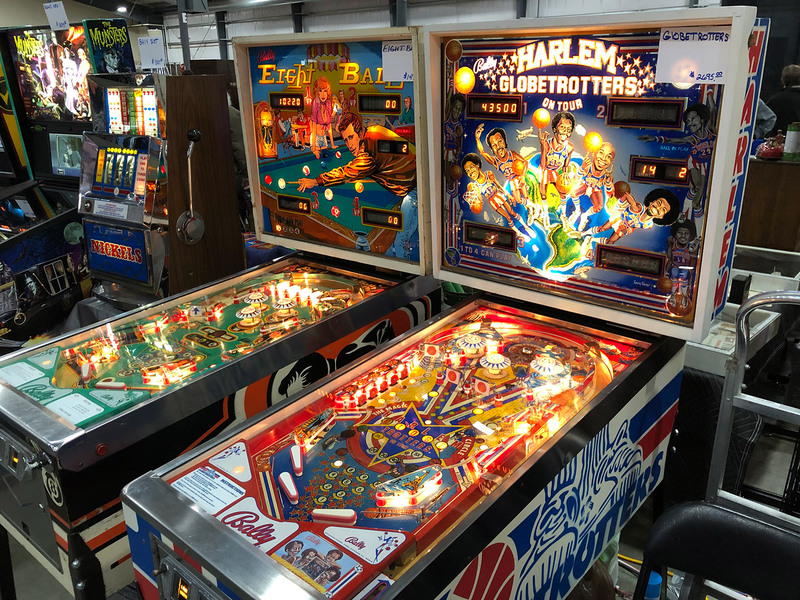 I haven’t done any research to verify this claim, but it seems to make sense given that a large number of major coin-op companies have called the greater Chicago area (Chicagoland) home over the years. In the last few years, the Friday before the show opens for general admission is reserved for ‘Dealer Preview’. All-access admission is $50 (which includes Friday-Sunday general admission) for buyers. On Friday a portion of the parking lot is set up as a jumble/flea market and entry to just the outdoor market for buyers is $11 per person. 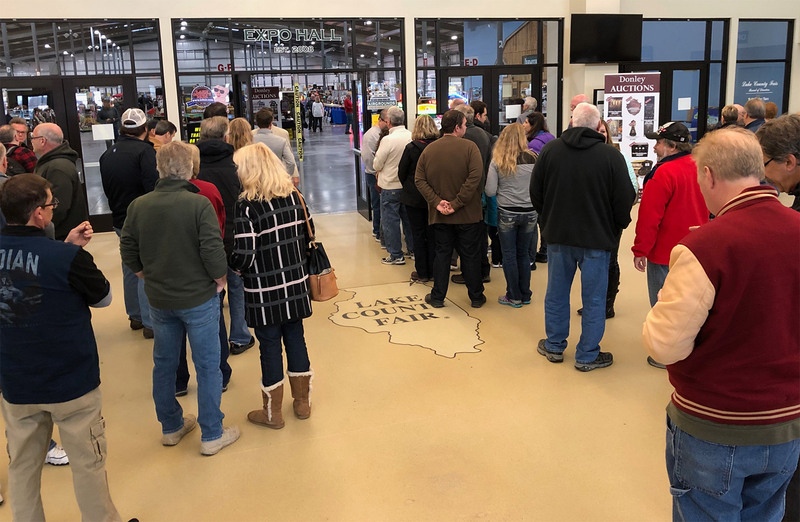 General admission to the indoor portion of the show on Saturday and Sunday is $7 with free parking. 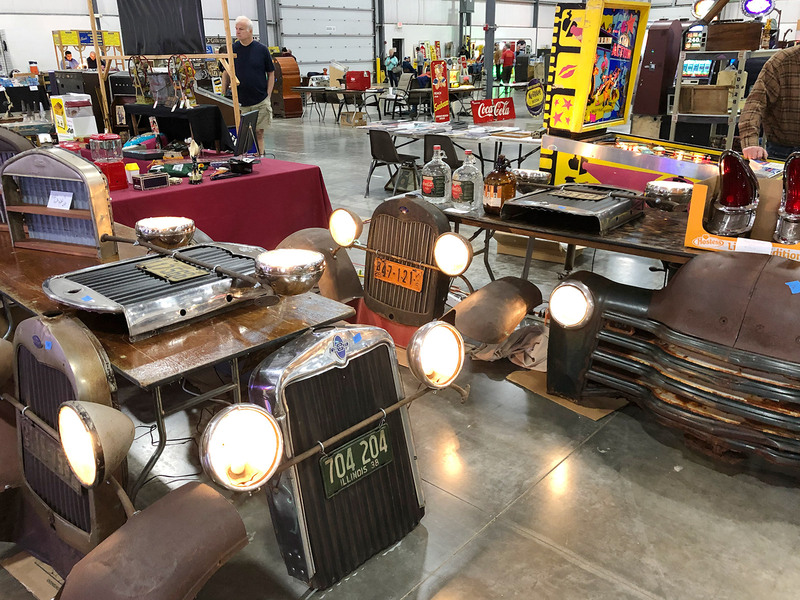 In recent years, Donley Auctions of Union, IL holds a collectible and antique auction Friday evening on the grounds of the Chicagoland Show that brings spirited bidding and some bargains. 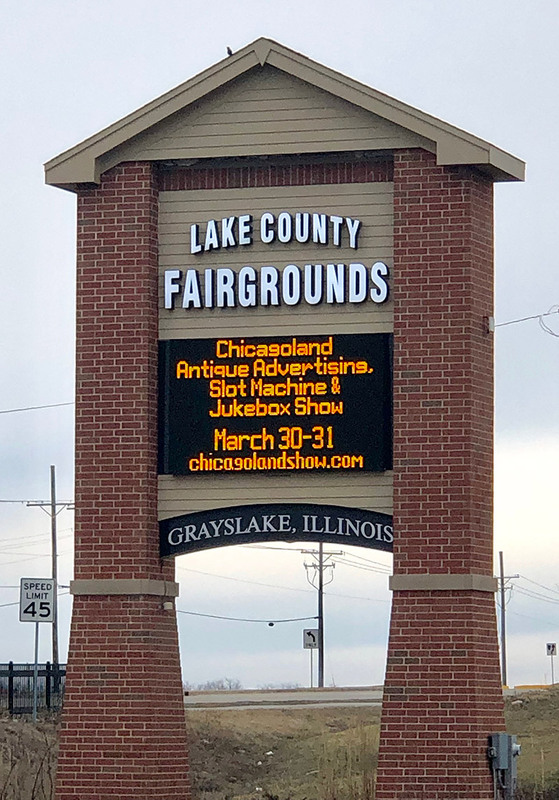 The Chicagoland show has contracted with NAVIS Pack and Ship to help with any items purchased at the show that buyers wish to have shipped anywhere in North America. 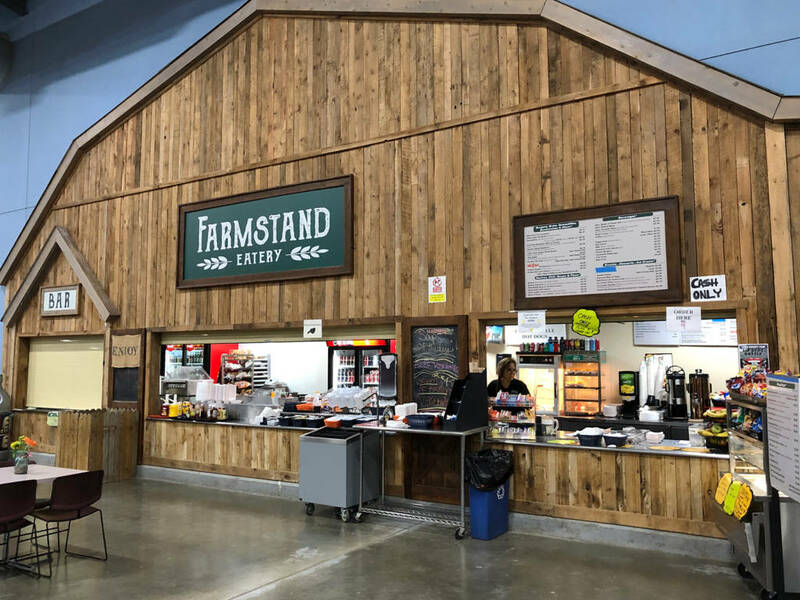 There is a comprehensive dealer information packet available by request on the website mentioned above if you are interested in becoming a vendor at a future show. I felt it was best to not include this year’s dealer information in this article because it is likely that it will change at future shows. 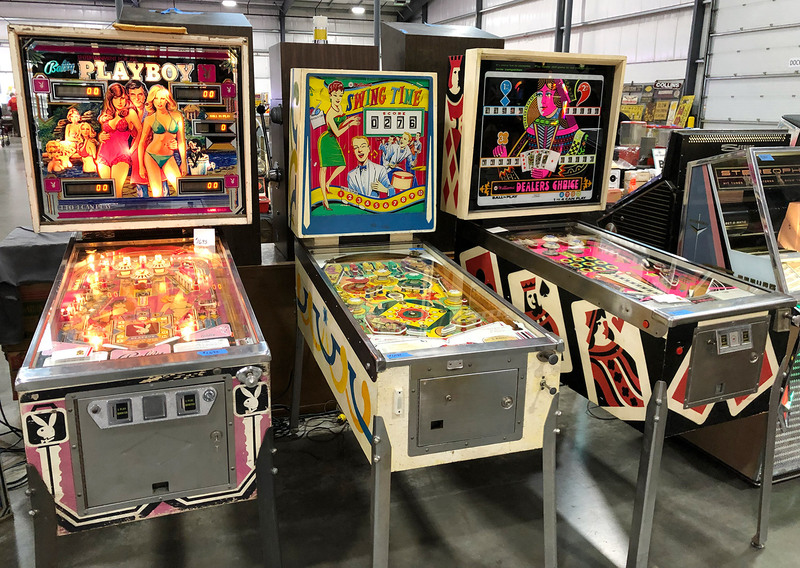 Since this is a review for Pinball News, I will focus as best as I can on the pinball and related games that were available at the Chicagoland Show. 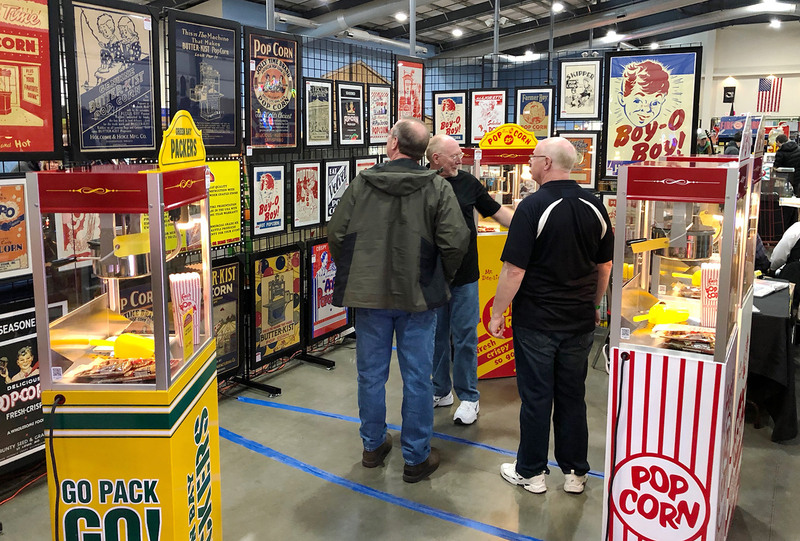 Having said that, I did want to mention that nearly every type of antique advertising and coin-op item that you can imagine was represented at the show. 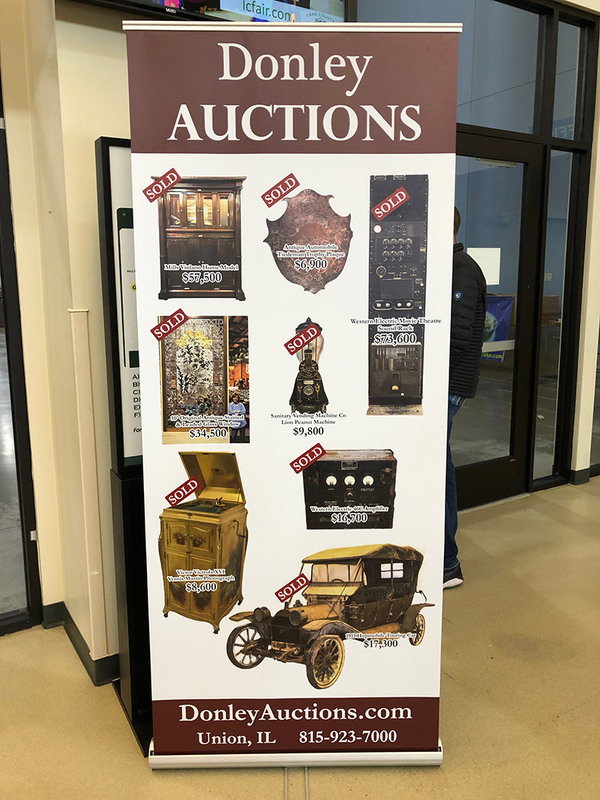 There was even a vendor with a large display of restored and customized antique outboard boat motors for sale. In retrospect this is not that surprising since Johnson, Outboard Marine (OMC), Briggs & Stratton, West Bend, Kiekhaefer Mercury, Kohler Marine, McCulloch and Evinrude outboard boat motor factories are or were at one time located in the northern Illinois and southern Wisconsin area. Of particular interest to me was a 1933 Baby Official by Mills Novelty Company. 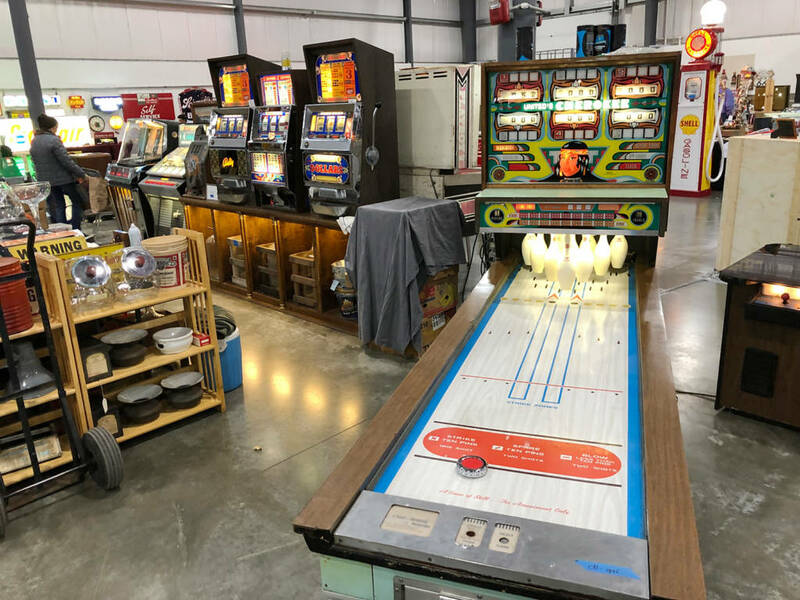 This was a counter-top flipperless pure-mechanical pinball that seemed to be in good restored condition with a $425.00 asking price. Even though it is a counter-top unit, this example had the plaque for the “pin table” version which has legs. 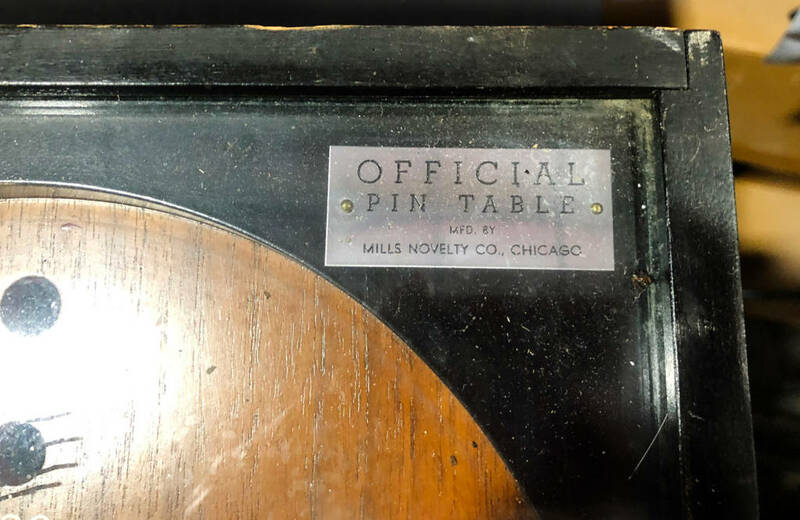 Apparently some of the counter-top units did have the “Official Pin Table” engraved plaque added at the factory. 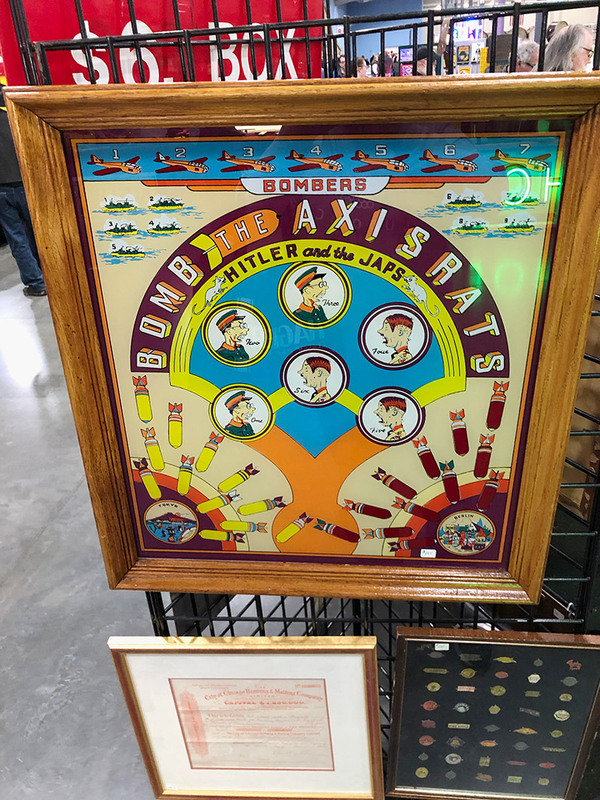 In the 1930s this game was 10 balls for one cent. This particular unit did not have the ‘rules’ or scoring/fortune card included. 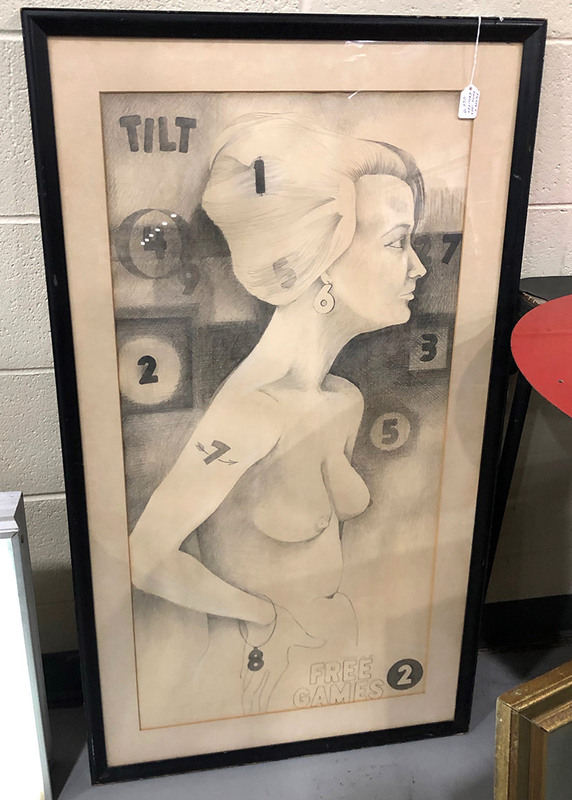 I noticed a nice Gottlieb Card Trix (1970) add-a-ball game that, at least in my travels, is seldom seen, asking for $1295.00. 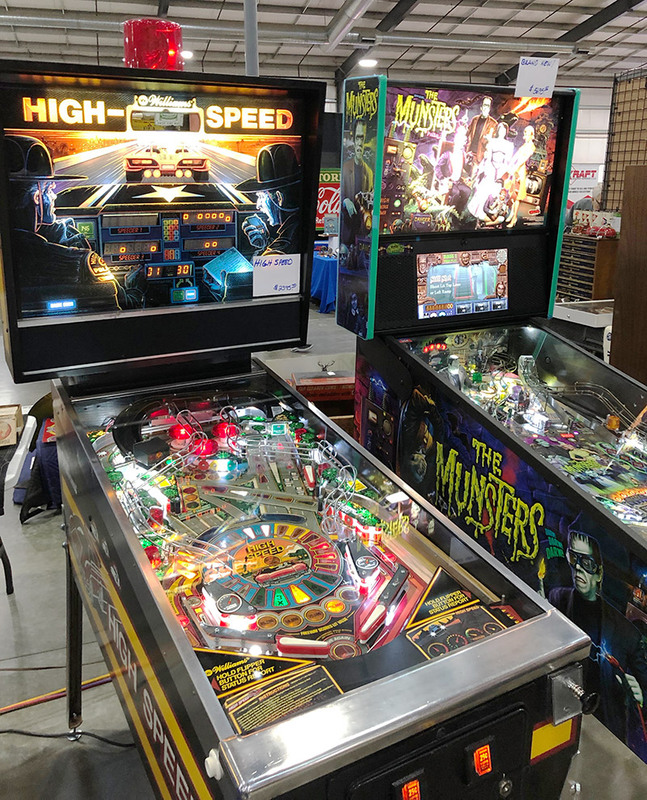 I chatted with one vendor who had just received his Stern The Munsters Pro game and had it proudly on display to quite a bit of interest by the public. 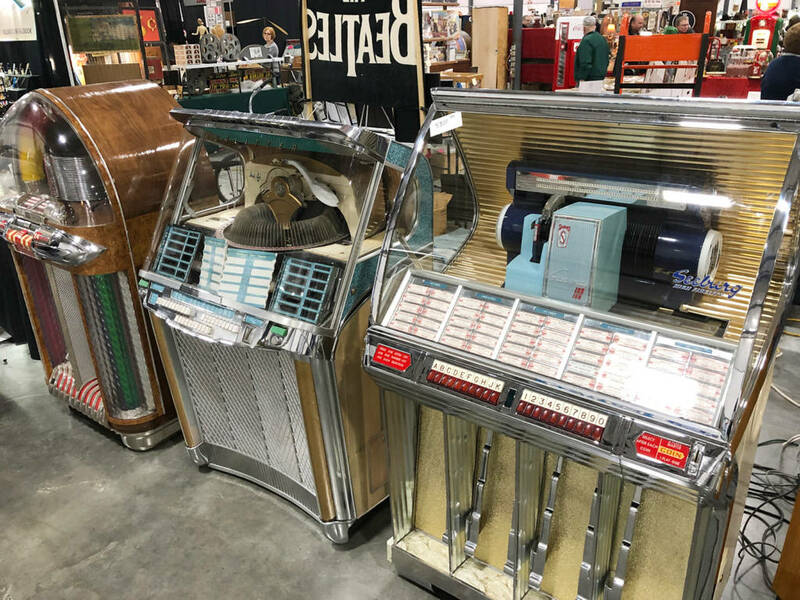 Some vendors offered translites and backglassses for sale, such as a restored Gottlieb Big Casino from 1961 asking for $250.00. 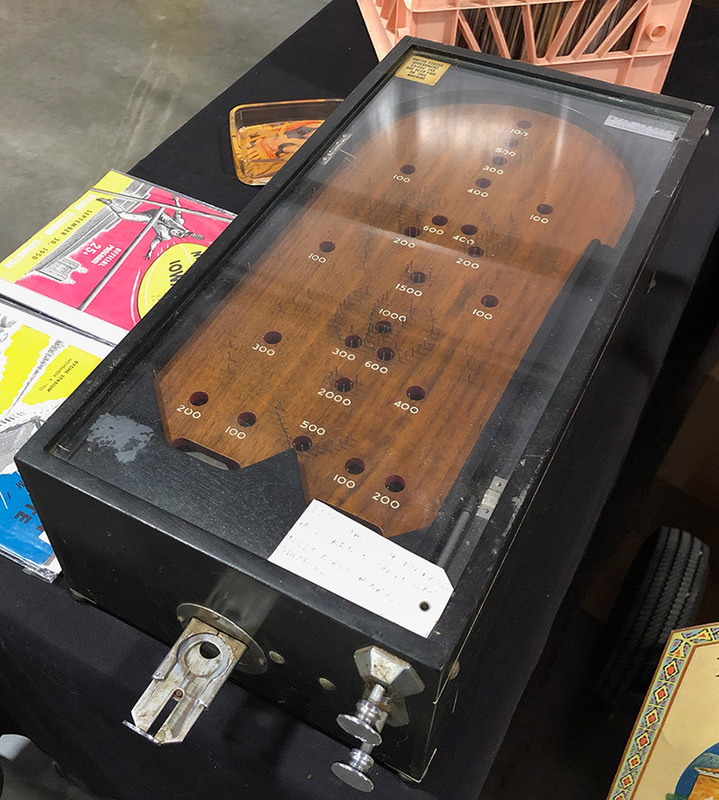 A couple of vendors had table-top toy pinball games from the 1970s with asking prices of $5-10. 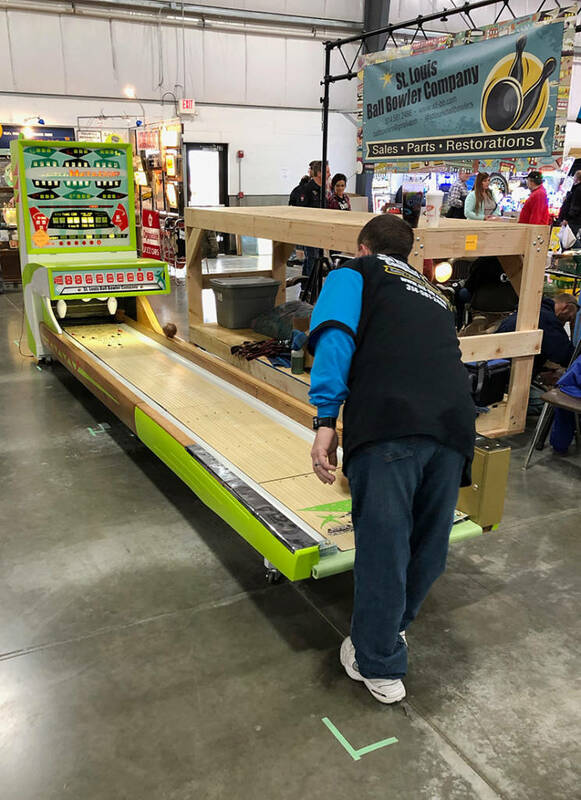 I confess that my love for bowlers goes back to my childhood where it seemed like every bowling alley had one for the ‘kids’ while the adults played the full-sized game. 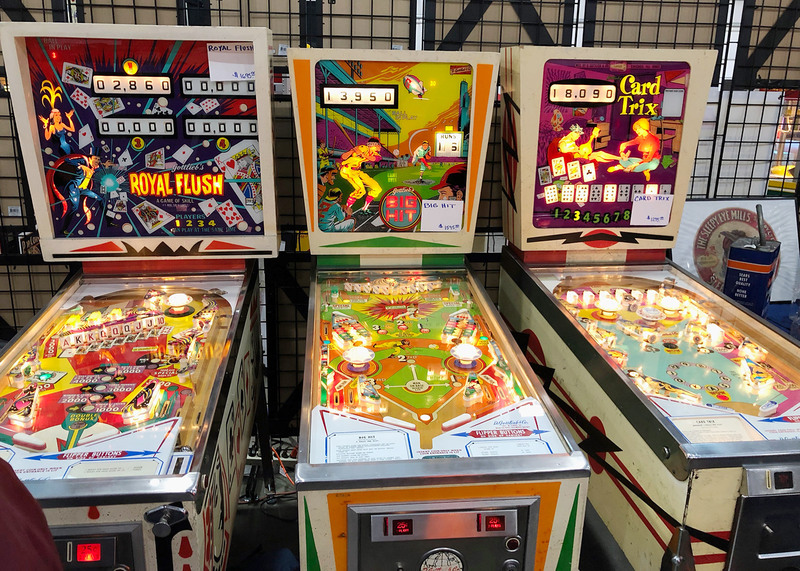 If and when we win the lottery I will have to get at least one bowler for my future game room. 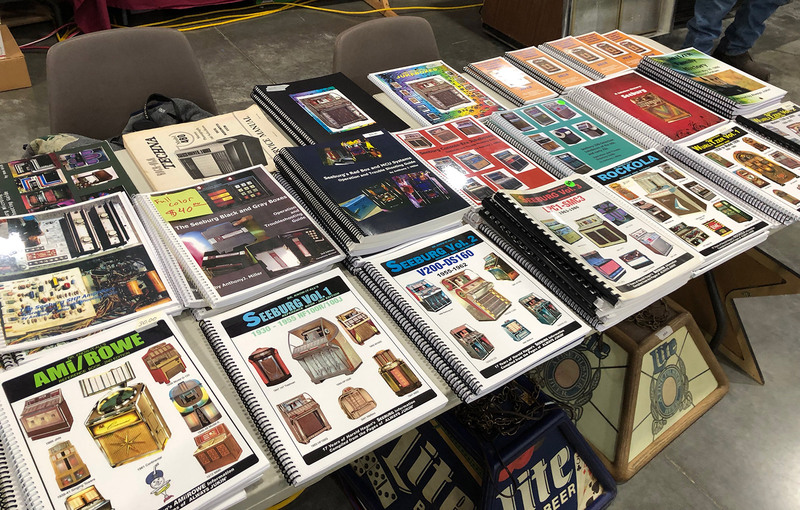 Service/repair manuals and sales brochures for vintage coin-op machines including pinball were offered by a couple of vendors. I am not enough of an expert to know if they were original or reproduction so I won’t comment other than it was nice to see that the service manuals are available for restorers. 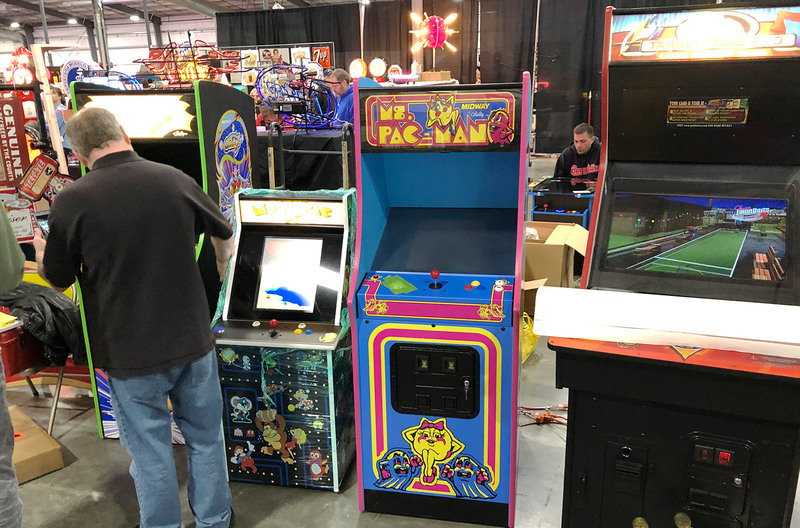 Although my time at the Chicagoland Show was limited, if you can call 4 hours “limited”, I had a wonderful time seeing what was on display and remembering things from the past, and even spotting a couple of vintage items similar to ones that I had owned during my youth. 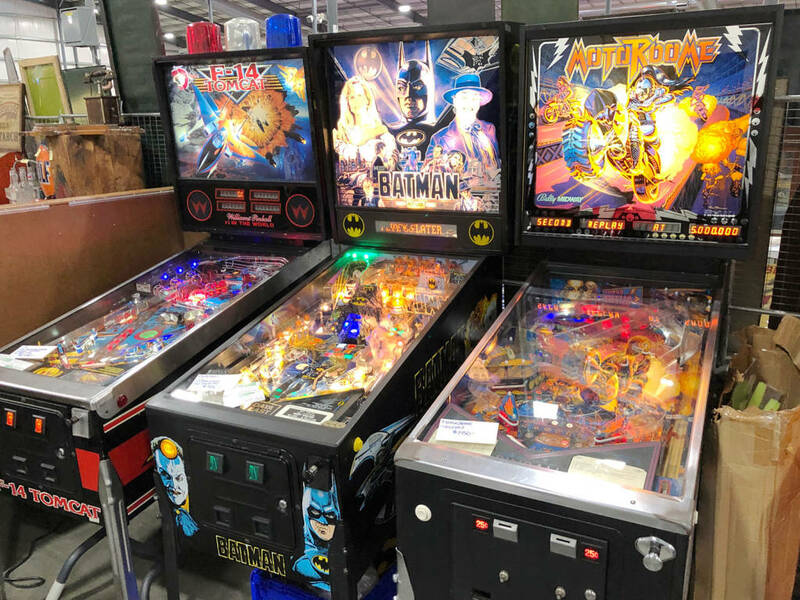 The Chicagoland Show is highly recommended for both those in search of a special game or item for their game room, and for those who just like to browse too. Please attend one of their future shows if you are able. I salute Penny and Bob Traynoff as well as Dawn and Kevin Greco for the hard work that they have put into putting on these shows for going-on 40 years.